What is it that makes a sympathetic hero, a compelling villain, a persuasive and realistic character? I can sum it up for you in one golden word. But you really should read the book for yourself. 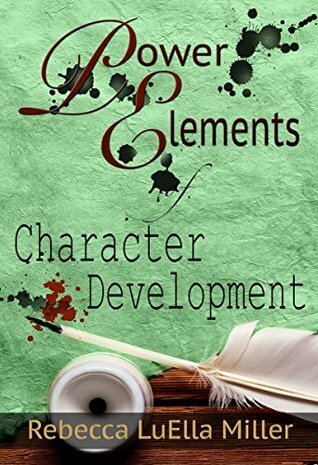 Power Elements of Character Development is the second book in the Power Elements of Fiction series, written by Rebecca LuElla Miller. Some time ago I read and reviewed the first book, Power Elements of Story Structure, and I knew then that I wanted to read this one, too. Characters are my favorite part of stories, and I am a writer. I knew I’d enjoy this book about writing characters. Power Elements of Character Development is only 138 pages long, but it is divided into 45 chapters, plus an introduction and a conclusion. These chapters organize the book effectively, moving easily over many different facets of characters, their creation, and their overall place in fiction. Minor characters, dialogue, inner conflict, antagonists, character arcs, character death, and what qualities make characters memorable or compelling are all considered. Most importantly of all, this book emphasizes that characters should drive the story rather than be driven by it, and their actions must, in turn, be driven by – and this is the golden word – motivation. It may be a beginner’s lesson that characters shouldn’t be passive, but even experienced writers can get lost in the blurred distinction between an active character and a reactive one. A character can be very active in his reactions, especially if what he’s reacting to involves live ammunition, but heroes should do more than just respond, and I appreciate how clearly this is established. I found the emphasis on motivation invaluable, and how it must be present not only as the story’s end goal (what the character ultimately wants) but also as every scene’s purpose (what he is trying to do right now). The insight regarding motivation helps to focus plots and scenes and characters, a prevention and cure of writer’s block. I enjoyed Power Elements of Character Development as a lucid, concise, broad-ranging review of the creation, use, and role of characters. Its points, especially about motivation, help me to focus and evaluate my own writing. Recommended to writers of all stripes. I invite you to check out Power Elements of Character Development on Goodreads and Amazon, and I highly recommend you visit Becky Miller’s writing blog Rewrite, Reword, Rework.